This is one of the forty 'magic' Bears. 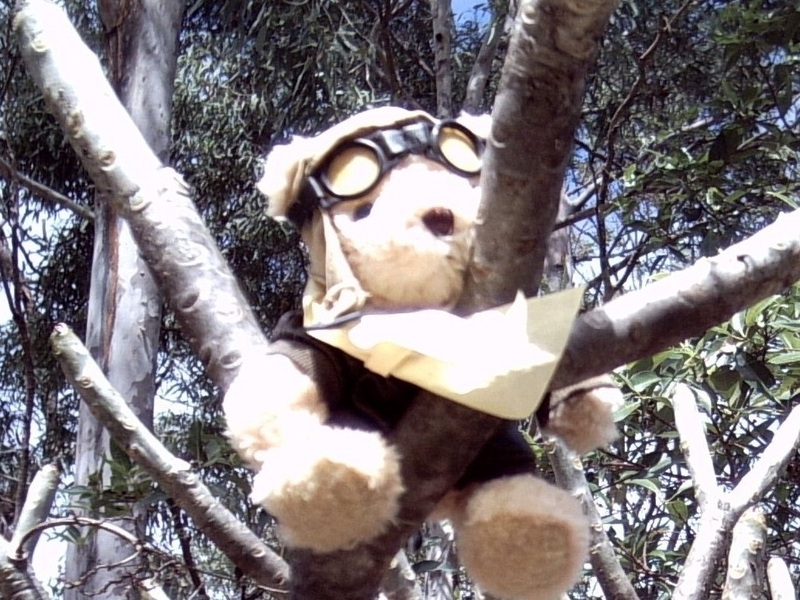 Pete the Pilot stuck in a tree. A Project to be completed. 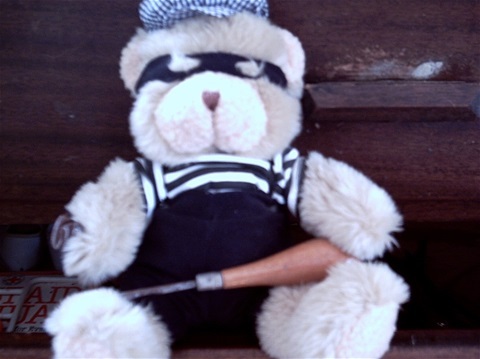 Burglar Bill. A gentle soul. He only broke into the cupboard to get the screwdriver to mend the doll's pram. n 2001 I began a Teddy Bear collection. (I have never been a collector of anything before).It was a kind of knee jerk reaction to the violence of terrorism we saw on our TVs. 9/11 impacted the lives of innocent children around the world who were inadvertently exposed to re-runs of planes constantly running into buildings and people dying. Many parents indeed did not know abut this until years later. Little ones often grew up believing that planes frequently collided with high buildings. My daughter had been married in the July and she and her husband were shocked and wondered if it was the right time to be considering having children. My reaction was to begin filling our house with signss reflecting the hope of childhood dreams and 'magic'. 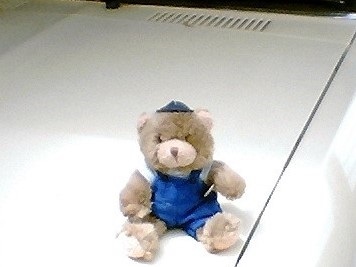 I began collecting the delightful little bears our local Newsagent was ordering. In all I collected FORTY. They still have the magazines which came with them. Their costumes are still pristine and I have their individual name badges and information etc. I wrote some stories about a few of these bears giving them 'real life' adventures which were always carried out in absolute secret. Only the animals were ever truly aware of what was going on when the humans were not at home. Children today sadly do not have the same 'interest' in teddy bears or accept the magical nature of the lives I have created. I have a renewed desire to finish stories and complete before my earthly departure this project I have started. Several stories were published in a local paper and children from the past LOVED them. I wonder if one day if my own family are not interested I may be prepared to sell the whole collection with all the stories written by me as well. My Greatest desire is that they will be appreciated and not disgarded like so much today regarded by a new technological age as 'old stuff'. I will share on this page maybe three of the finished stories. Perhaps I can include a slideshow of some of the bears with pictures. Geoff upsets the dog by digging up her bones by accident. Harry goes for a walk and get stuck in a cactus bush. Everyone panics when He does not come home. Hot and frustrated he does not know why he has to be dressed in such a HOT costume. He meets a Christmas angel and fulfil his purpose. He gets into strife when he tries to 'tinker' with a real car. 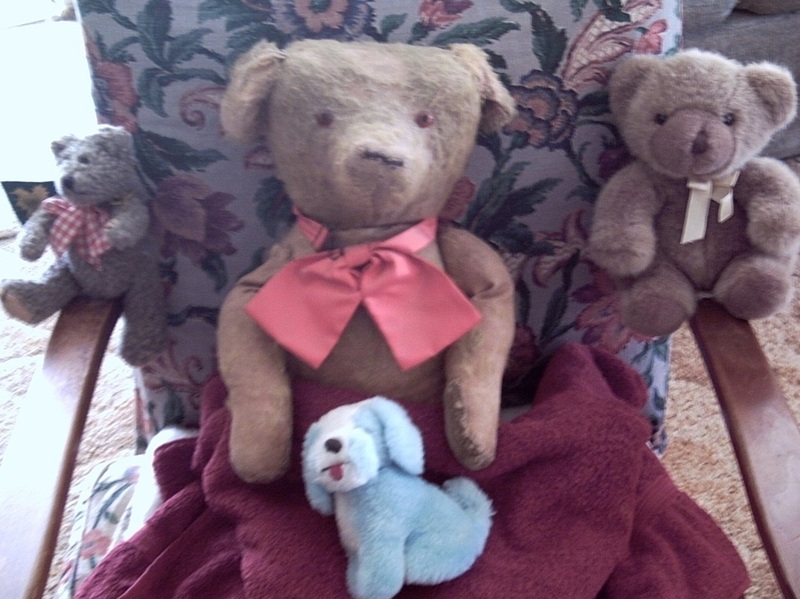 OLD TED and the bears who were in the house when all the 'others' came. Life was never to be the same. 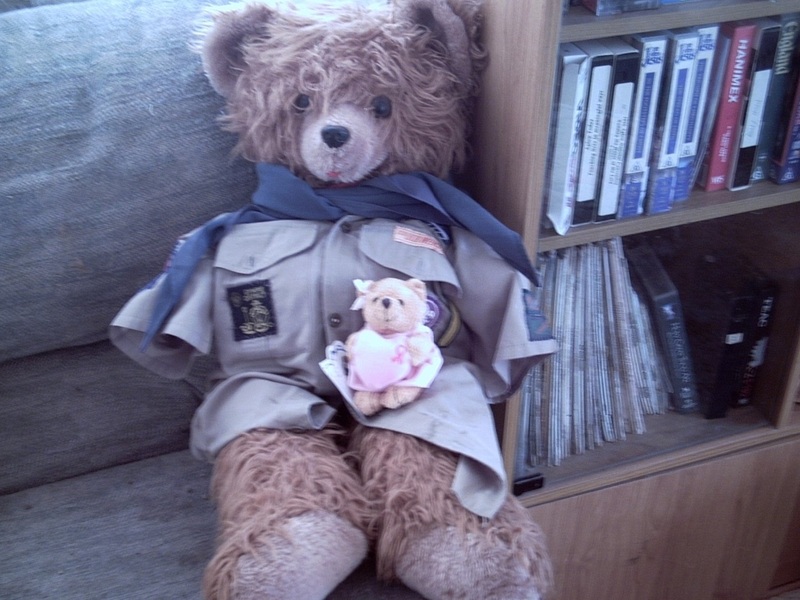 Uncle Joseph and Sue Care Bear......They belonged to the children but got involved in all that began to happen. (Often against their will). 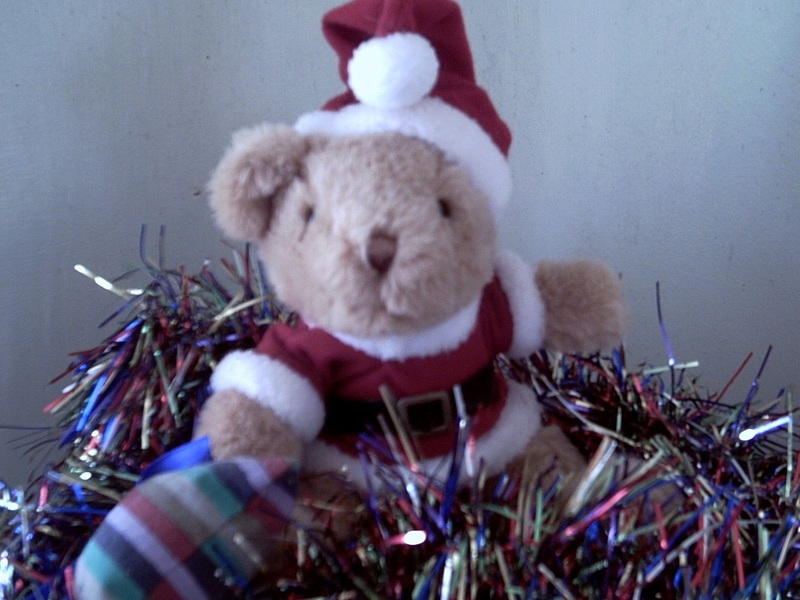 One of the bears had not returned to his place in the display cupboard. 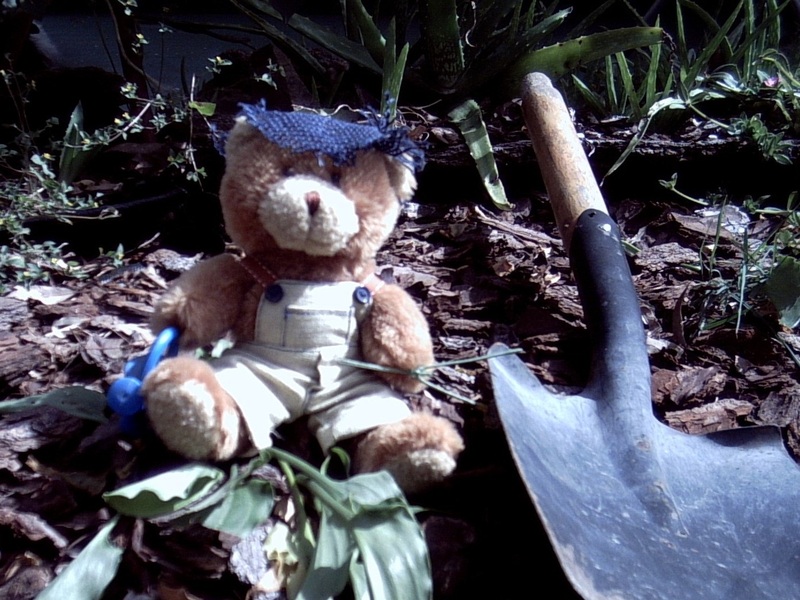 Francis the Florist Bear had told old Ted ‘I’ll be back as soon as I can. There’s something I have to do.’ It had been two days now, and although Phillip the Photographer Bear put his camera beside him and everyone spread out, there was still a space. Six year-old Jeffery Baker had been in the Children’s Hospital on Mayfield Drive for four long weeks. He had been very sick but was feeling better now. He wanted to go home. He missed his Mum and Dad. They came to see him every night but it wasn’t the same as being with them all at home. What surprised him most was, he even missed his bossy brother Ben and silly little sister Susan who wandered around the house all day talking to her dolls. ‘I want to go home. I’m bored’ he complained when the doctor came for his daily visit. 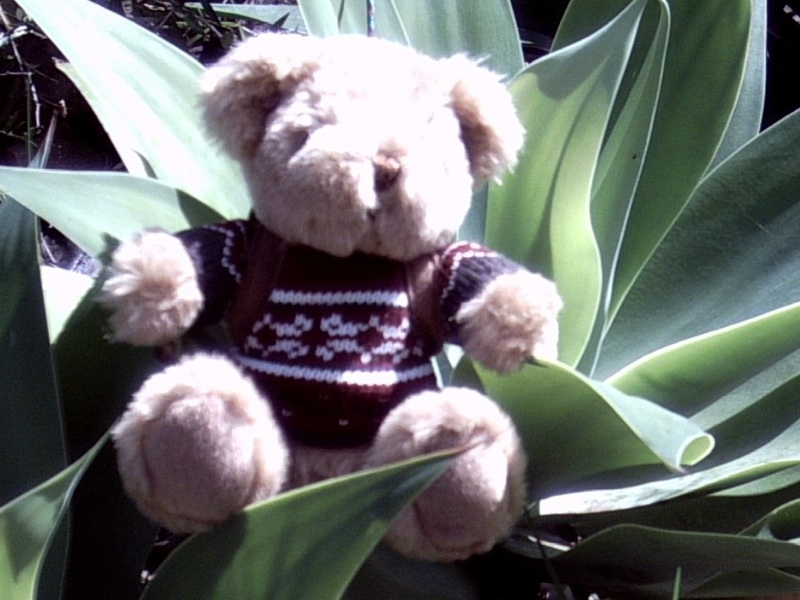 Francis the Florist Bear arrived in the afternoon. He came in, hidden on the tea trolley, pushed by Nurse Kristie. He wore his red bow tie and red and white striped shirt. A notebook was in the pocket of his blue denim apron. He carried a bunch of red and yellow flowers. He jumped down onto the bed. The bear remained seated, still and silent. His gentle brown eyes watched until he was alone with the small boy. ‘Can you keep a secret?’ Francis leaned across and spoke softly. His furry nose brushed the boy’s cheek. ‘Yes’ the little boy whispered. 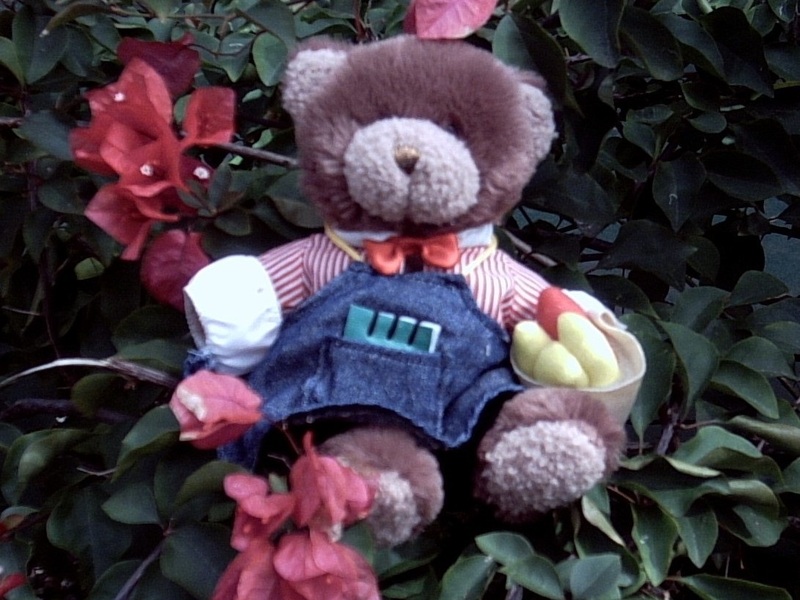 The small boy watched the little bear skip across the room, As promised, he placed his bouquet of artificial flowers in the vase. Carefully, he added water from a jug on the table. He turned. There was a sudden sound behind him. The returning trolley, pushed by Nurse Kristie, trundled past. Running, he made a huge jump, and settled himself down again among the cups and saucers. He looked back at the small boy in the bed, waved a brown paw, and laughed. Jeffery smiled as the clown bowed and then promptly fell flat on the floor. A curly blond wig spread out like a carpet and covered his head and most of his body. ‘I liked your other friend Francis too’ Jeffrey whispered in the doctor’s ear. Dr Williams reached down to give Koko a big hug. Then, they began pushing and shoving. Suddenly, they both were splayed across the floor, in a tangled. heap. He scrambled groggily back onto his feet, hauled the doctor up by his tie, and shook him furiously. Jeffrey laughed as the two now danced around the bed. ‘A florist brought them.’ Jeffery nodded proudly. He was determined to keep the secret. He’d made the bear a promise. The two men looked at each other. They nodded approvingly but just for a moment Jeffery thought he saw the doctor wink at him. He settled back on the shelf and clapped his paws – once, twice three times. Now, through the glass panel of the display cupboard, a line of bears can be seen sitting straight and still. Proudly on the shelf beside Phillip the Photographer sits Francis clutching in his brown paw, a pretty posy of red and yellow soft fabric tulips.